The Klamath is recognized as an outstanding whitewater boating river with many class III- IV+ rapids, warm water and a long boating season. Steep, boulder strewn rapids in the Hell's Corner gorge testify to the Native American name for the river, "Klamet," meaning "swiftness." 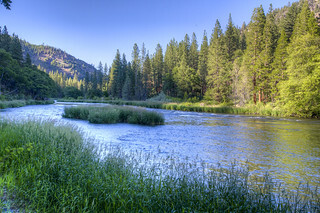 The abundance of resources, such as a unique rainbow trout subspecies, spectacular scenery, Native American cultural sites and gold rush era historical sites, combine to provide the setting for a spectacular and profound river experience. Unique combinations of landform, water and vegetation create a continually changing landscape as it changes from desert to mountainous. Steep canyon walls covered by a variety of pine, sage and juniper and decorated with basalt outcrops create an exceptionally peaceful experience. Other popular activities include camping, fishing and scenic four-wheel drive touring. Photo by Bob Wick, BLM. The Wild and Scenic Rivers Act provides three levels of river classification: wild, scenic, and recreational. Wild rivers are free of dams, generally inaccessible except by trail, and represent vestiges of primitive America. Scenic rivers are free of dams, with shorelines or watersheds that are still largely primitive and shorelines that are largely undeveloped, but accessible in places by roads. Recreational rivers are readily accessible by road or railroad, may have some development along their shorelines, and may have been dammed in the past.